. The reason why we talk about Web Hosting Choices is so you may incorporate such understanding into your project as to recommending what web hosting arrangements would be most suitable for your situation. other equipment. E-commerce applications run across the various platforms. Located in the data center or in a separate network operations center (NOC) are typically server-management and configuration systems. This data center needs to be secured against physical intrusion and equipped with fire suppression, uninterrupted power supply (UPS), and disaster recovery systems. Many service providers offer consulting or professional services, and most provide help desk and technical assistance." "Web hosting services allows business to jump into e-commerce without spending a fortune"
ISPs provide the connection, and services eg, FTPing, credit card processing , etc. "Virtual Hosting allows you to point additional domain names to your server. These domain names can then point to specific directories on your server. 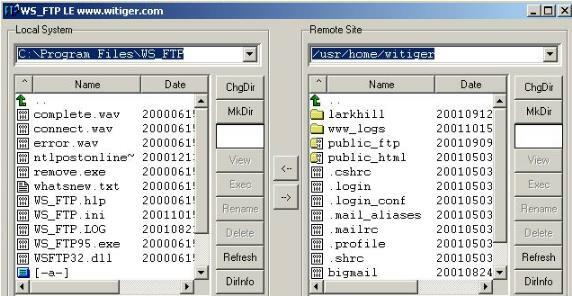 This allows you to divide a single Web server into several smaller virtual hosts, which you can sell to other people. This is the same technology used by most large Web hosting companies." A strongly one-sided view of the advantages of a Virtual Server, worthwhile to look at since they explain many terms. 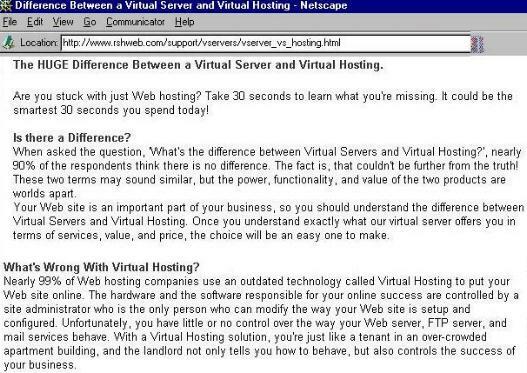 _vs_hosting.html "What's Wrong With Virtual Hosting? 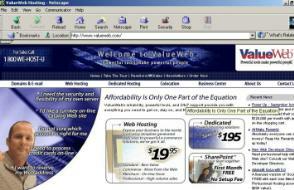 Nearly 99% of Web hosting companies use an outdated technology called Virtual Hosting to put your Web site online. The hardware and the software responsible for your online success are controlled by a site administrator who is the only person who can modify the way your Web site is setup and configured. Unfortunately, you have little or no control over the way your Web server, FTP server, and mail services behave. With a Virtual Hosting solution, you're just like a tenant in an over-crowded apartment building, and the landlord not only tells you how to behave, but also controls the success of your business." "A Virtual Server or Virtual Host [Schneider lumps them in together] is a feature that maintains more than one server on one machine. This means that different groups can each have their own domain name, but all domain names refer to the same physical Web server".
. 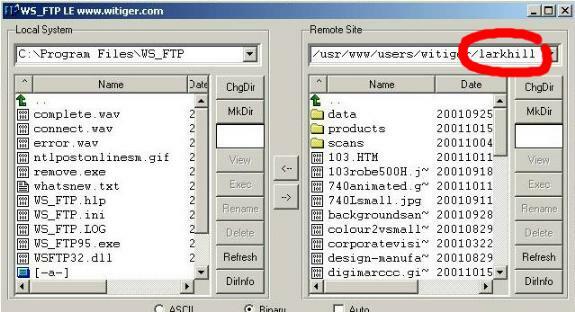 Meaning when you FTP up to a computer acting as a virtual Host - all the files go in the same place - you simply divide them into different subdirectories to organize them. The reason we talk about this in class is because most small businesses have a Virtual Host they share with others - there are some cost savings, but also some security risks of sharing hard drive space with someone else.
. For those people not too familiar with Domain Names, it would be very good to read page 380 - 385 in the i-Net+ Guide 2nd Edition. 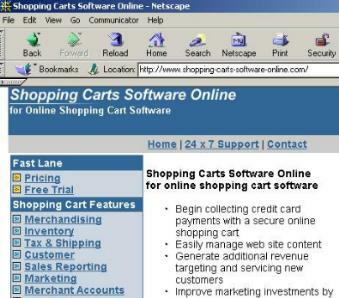 "The forms-based method of ordering has given way to electronic shopping carts"
A number of companies sell shopping cart software that sellers can add to their websites - and most hosting services can also provide this as an extra service. This is just one example, by the end of 2002, there are many companies that offer this service, some are independent, some are affiliated with credit card companies, some are affilicated with large ISP's, and some are affiliated with financial services companies.
. Broadband Media is a term students will find referred to when talking about connecting to the Internet. This term refers to ANY type of network media (cable, DSL, etc.) that carries more than mone type of transmission - therefore the the term Broad band from broader band. Cable MODEMs are an example of Broadband cause the actual cable carries your TV signal, and the data for your PC to connect to the Internet. Both Digital Subscriber Line (DSL) and cable modem services offer high-speed Internet access. Compared to traditional dial-up access, these two technologies open up homes and small businesses to a new realm of possibilities for network connectivity and applications. 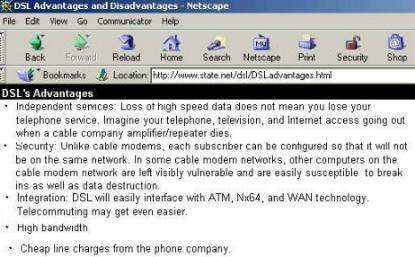 "While similar in many respects, DSL and cable modem differ in some fundamental ways. 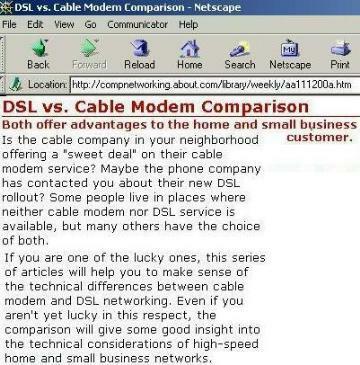 Some of the differences between DSL and cable modem arise from the history of the technologies they are built upon. Others originate with differences in the approach of service providers." "In terms of theoretical peak raw performance, cable modem generally wins the speed battle over DSL. Cable technology can, in theory, achieve networking speeds of approximately 30 Mbps (using a 100 Mbps network interface card), whereas most forms of DSL cannot reach 10 Mbps. In practice, though, the speed advantage of cable over DSL is much lower than might first be apparent. Both cable modem and DSL performance vary from one minute to the next depending on the pattern of use and traffic congestion on the Internet. This means that both services will rarely -- if ever -- reach peak performance. " . So, theoretically Cable is much faster than DSL, but, because of many limitations (some business related, some human error, some based on being swamped by subscribers at peak times) cable is not always SO MUCH faster that it is worth it for the security weakness. "... cable modem technology delivers shared bandwidth within the local neighborhood while DSL delivers dedicated local bandwidth". If your bandwidth is dedicated to you, it cannot be seen so easily by others - if it is shared, like in cable, you are vulnerable. - the advantage is that you can be hooked up to the internet through a DSL connection, but still make phone calls over the same copper line !